ULAND Artificial Hedges Panels, Boxwood Greenery Ivy Privacy Fence Screening, Home Garden Outdoor Wall Decoration, Pack of 4pcs 10"x10"
ULAND Uland Artificial Hedge Fence Panels are vividly natural looking, perfect to conceal unsightly views such as air conditioning, rusty chain link fences, dirty walls, unsightly areas, turning them into a brand new look. Small and detailed green leaves provide a dense, lush and natural look, without gaps, aesthetically creates a completely private space while you are relaxing in your own yard and playing with family. Both panels and foliage are UV resistant, they can last for a reasonable period of time when exposed to direct sunlight and will not fade or discolor. Weather resistant, to guard your yard no matter hot days or chilly nights. 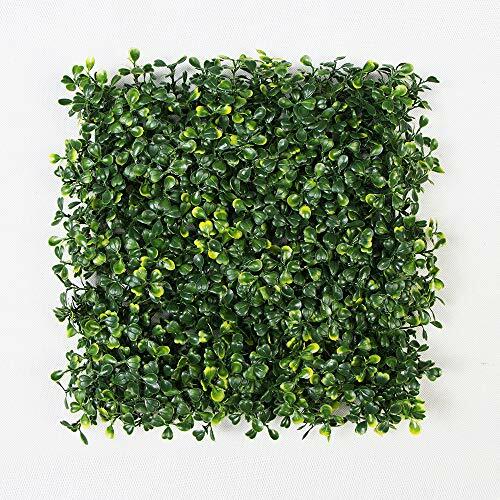 Various kinds of artificial boxwood hedge foliage in shapes, types and colors, makes it look like real plants, easily trim and install, fit desired shapes and dimensions to beautify and transform your rooms, walls, corridors, stairways, patio, balcony, yard, garden, fencing, storefronts, bar, hotel, shopping malls, adding curb appeal. What's more, artificial boxwood panels are ideal to decorate wedding backdrops, dessert tables. Such Life-like greeney will definitely add charm and elegance to your special events such as weddings, ceremony, birthday, anniversary, Christmas, fashion show, product release, summer pool parties making it an unforgettably pleasant memory. If you have any questions about this product by ULAND, contact us by completing and submitting the form below. If you are looking for a specif part number, please include it with your message. ULAND Artificial Hedges Panels, Outdoor Greenery Ivy Privacy Fence Screening, Home Garden Wedding Decoration, Pack of 4pcs 10"x10"